I’m back again! Okay so I might be a bit of a film addict……..but there’s nothing wrong with that right???? 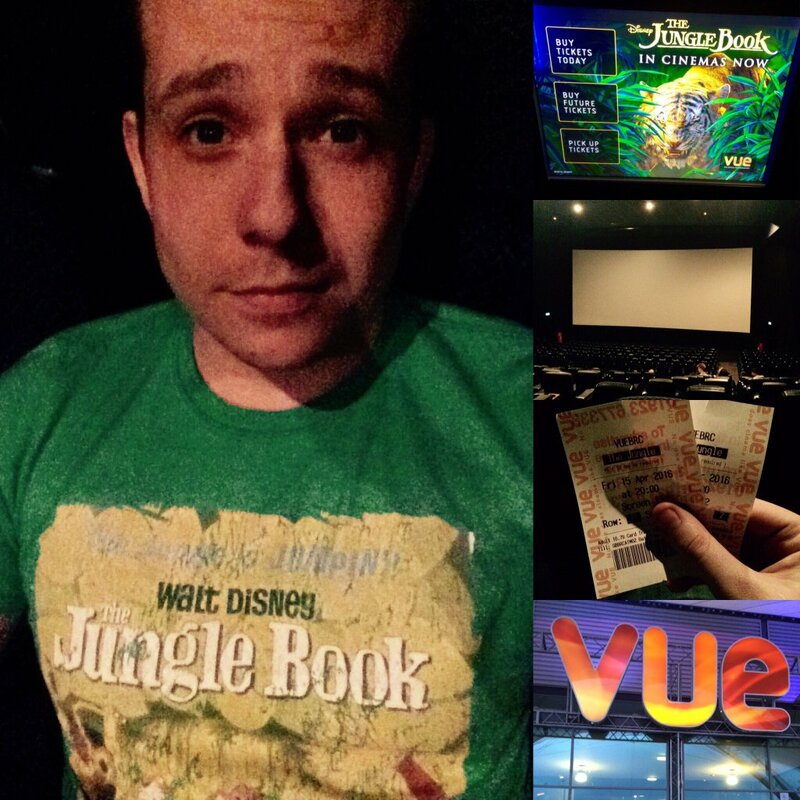 The only thing that may have been a little bit over the top was wearing some of our Jungle Book merchandise to the cinema!?!?! I have also been slow at writing blog posts lately (because we have a surprise to reveal in a few weeks time) oh and of course I love Iain’s amazing baking, so much so I gave him top marks. So back to the film, Jungle Book has been out for a few weeks now and I was lucky enough to see it on the day of release. One of the first things I have to say is that you should forget about your worries when you go to see this movie, it has all the markings of a future classic, and will leave you wanting to watch it over again. What about the Human Cast? The way in which it blends real life with impeccable animation is done in such a seamless manner, it will leaving you thinking that a talking tiger and a gangster Gigantopithecus (an extinct species of the ape family) are a natural occurrence. Neel Sethi’s performance was both uplifting and believable throughout the entire movie. At one point Mowgli and Baloo sing the timeless classic Bare Necessities in such a fun and “normal” manner, you clearly feel that it was sang naturally and not dressed up in any way. What about the Animated Cast? The quality and realism of the computer generated animals is amazing, it will have you wondering whether Jon Favreau went back in time, sat with a Gigantopithecus down and taught him how to become the godfather! It has been 122 years since the publication of Rudyard Kipling’s classic. The Jungle Book is light, breezy, and optimistic and on a technical note a marvel of film-making. This is a clearly going to be a future children’s classic which is shown by the care given to every detail. Just a final note that if you are taking very young eyes to see this, Sheer Khan is quite a scary tiger. Overall it is a very strong 4 chunks from me!!!! TruffleShuffle gives it 4 Chunks out of 5. Next PostNext 20% off all Star Wars… May the 4th be with you!